European Union leaders Friday drew up new plans to screen migrants in North Africa for eligibility to enter Europe, saying they set aside major differences over stemming the flow of people seeking sanctuary or better lives. But the show of unity did little to hide the fact that the hardest work still lies ahead. Even as they met in Brussels for a second day, Libya's coast guard said about 100 people were missing and feared dead after their boat capsized in the Mediterranean. The leaders agreed on a "new approach" to manage those rescued at sea, just as bickering over who should take responsibility for them undermines unity and threatens cross-border business and travel in Europe. Italy, Greece and Spain bear responsibility for accepting most of the migrants and have felt abandoned by their EU partners. Italy, with a new anti-European government, has refused to take charge of people rescued at sea in recent weeks, sparking a diplomatic row with France and Malta. 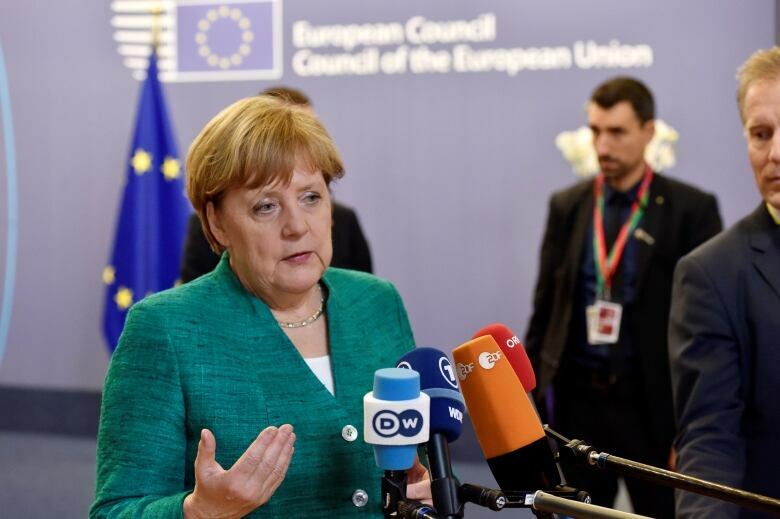 In Germany, Chancellor Angela Merkel's coalition partner is demanding she take a tougher line on migrants, undermining her leadership. The new plan is to receive people from rescue ships in EU nations that agree to share responsibility for handing migration with the EU's main point-of-entry countries like Spain, Italy and Greece. But they also will receive them in centers in North Africa and possibly the Balkans. "A complete approach was adopted," French President Emmanuel Macron told reporters after a night of haggling and delays to address demands from Italy that its views be incorporated in the final summit statement. "We are protecting better. We are cooperating more. And we are reaffirming our principles. 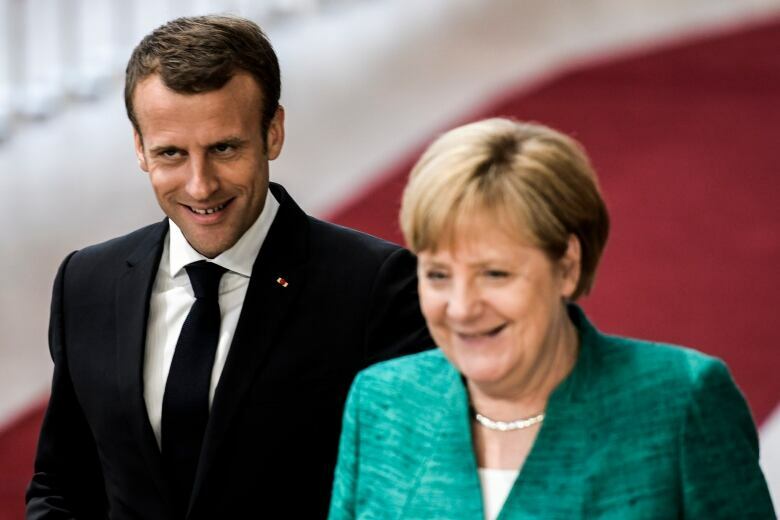 All hastily made solutions, be they solely national ones or a betrayal of our values that consists in pushing people off to third countries, were clearly set aside," Macron said. 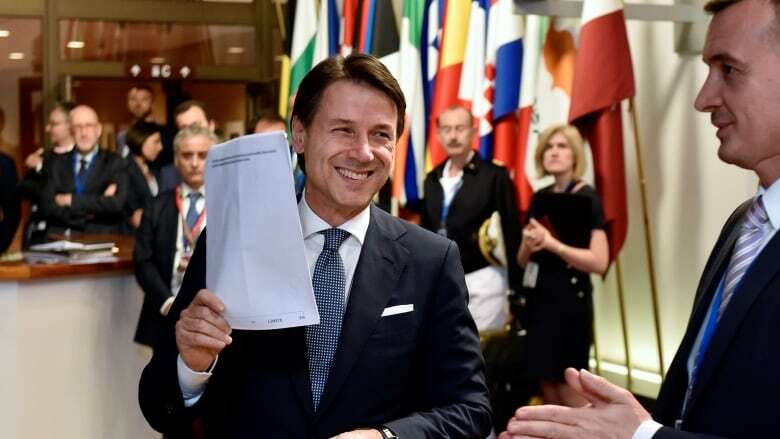 Even new Italian Prime Minister Giuseppe Conte, whose populist government has rocked the EU's political landscape, said: "On the whole, we can say we are satisfied." "Italy is no longer alone, as we requested," he said. "Why should there be centres? Centre should be outside of Europe. Ellis Island, yes? And the Australian model, very simple. We have to execute this," Czech Prime Minister Andrej Babis said. The "disembarkation platforms" are a logical extension of the EU's migrant deal with Turkey. The government in Ankara was paid more than €3 billion in refugee aid to stop people leaving for the Greek islands. The bottom line is that numbers have dropped by about 96 per cent, compared with 2015 when well over 1 million people entered Europe, most of them fleeing conflict in Syria and Iraq. Algeria, Egypt, Libya, Morocco, Niger and Tunisia are touted as possible locations, even though details of the plans are sketchy. Morocco already has refused and none of those listed has volunteered to take part. The EU's executive Commission now must draft something more concrete in coordination with the UN's refugee agency and the International Organization for Migration, which would prefer to operate in European migration centres only. Libya is a major transit point to Europe for those fleeing poverty and violence in Africa and the Middle East. Traffickers have exploited Libya's chaos following the 2011 uprising that toppled and later killed dictator Moammar Gadhafi. How much the plans will cost remains a mystery, but it won't be cheap. The UNHCR cautiously welcomed the plan but warned that it must be fleshed out and that African involvement via the African Union regional bloc is "indispensable." IOM spokesperson Leonard Doyle said his agency was "very pleased at the solidarity and consensus" that emerged in Brussels, in particular with front-line states such as Italy. Doyle said he believed most of the "disembarkation centres" would be in Europe, although he said it was up to the EU to determine which countries would host them. UNHCR spokesperson Charlie Yaxley said the refugee agency is "still awaiting the legal analysis" of the new plan but would certainly welcome greater EU collaboration on handling asylum claims. He noted that for the fifth year in a row, the "grim milestone" of 1,000 migrant deaths in the Mediterranean has been passed already, just halfway through 2018. "It is far too early to talk about a success," EU Council President Donald Tusk told reporters after a compromise was found. "This is in fact the easiest part of the task, compared to what awaits us on the ground, when we start implementing it." Experts and humanitarian aid groups fear the show of unity is a political smoke screen to address the concerns about resurgent anti-migrant parties that will only leave vulnerable people once again at risk. "European heads of state and government continue to try to offload their responsibilities onto poorer countries outside the EU," said Oxfam migration policy adviser Raphael Shilhav. 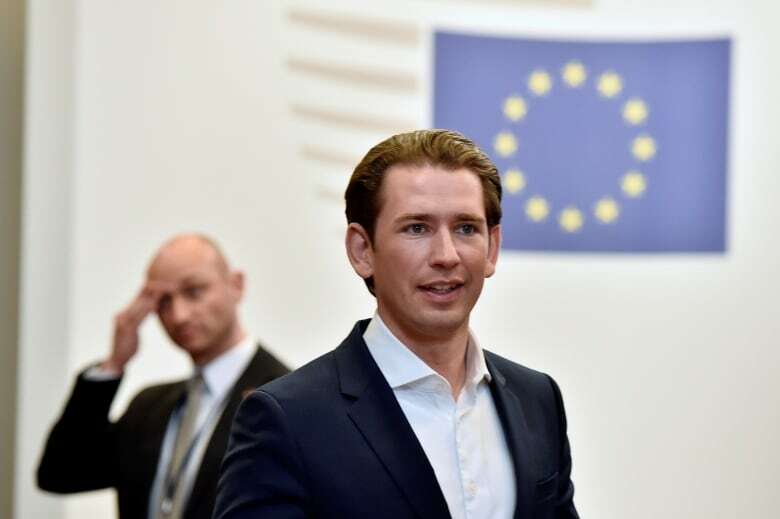 He said it looks as if the EU is planning more "de facto detention centers," warning that "this approach to migration is a recipe for failure, and directly threatens the rights of women, men and children on the move." Imogen Sudbery at the International Rescue Committee said the "disembarkation platforms" raise more questions. "Would this approach be compatible with international law? Would those apprehended be transferred to the nearest safe port? Crucially, under which country's law would claims be assessed? Who would be responsible for those whose claims are upheld? We need clarity on this," she said. "For months now, they have been presented as an official body, formal, very well trained and legal. And these are the same people who have shot at us, who have kidnapped us," said Capt. Riccardo Gatti. "All of this is theatre." In the latest reported capsizing in which about 100 people were missing, Libyan coast guard spokesperson Ayoub Gassim said 16 were rescued from the water east of the capital, Tripoli, and the bodies of three children were recovered. He quoted a Yemeni survivor as saying the boat carried about 125 people. The Astral's crew said Italian officials had told it to let the Libyan coast guard respond to a distress call from the boat, only to hear reports shortly afterward that the 100 migrants were missing and feared dead in the same area. Gassim added that the Libyan coast guard had intercepted three other smuggling boats carrying about 345 people east of Tripoli. Spanish maritime rescue services, meanwhile, brought ashore 90 people pulled from boats as they tried to cross the Strait of Gibraltar from Morocco.